It takes less than 60 minutes to fly from Miami to go back to a world of 60 years ago in Havana, Cuba. It is a world that is truly unique, dominated by 60 years of revolutionary ideology. Miami is a city which displays the full spectrum of American life. It celebrates the country’s diversity, great strengths, culture, dynamism, violence, drug culture and rampant materialism. How, I mused, would Karl Marx and Vladimir Lenin have reacted to the contrast between Miami and the last state to have stuck to its embrace of the Marxist-Lenninist economic model for so long? Would they think their theories a success or a failure? Cuba has had an unfortunate history. Twenty years after the arrival of Colombus in 1492, the Spanish colonised the country. Even by the standards of the Spanish, the colonisation was a brutal affair, effectively wiping out the indigenous Indian population and instituting a savage system of slavery which was only abolished in 1886. In 1762 the British briefly kicked out the Spanish, but shortly after this swapped Cuba for Spanish controlled Florida. In 1868 a number of Cubans of Spanish descent began a long and extremely bloody campaign for independence. The death toll and destruction over several decades was substantial and it culminated in 1902, when American intervention saw Cuba nominally gain independence. Nominal because the Americans did not involve the Cubans in the 1898 Peace Treaty in Paris which led up to Independence. And they conveniently inserted into the Cuban constitution clauses giving them the right to intervene in Cuba whenever they saw fit and a lease to establish a naval base in Guantanamo Bay. At the time of independence Cuba essentially had a two tier economy – a small, landed gentry, mostly of Spanish origin, whose wealth was largely founded on sugar, tobacco and coffee and on display in magnificent homes in Havana and elsewhere, and a much exploited peasant class. In 1952 Batista, formerly a military officer who during his first four year stint as elected president in 1940, instituted some reasonable reforms, staged a comeback via a military coup. He suspended the Constitution and revoked most political liberties. He received recognition and support from the USA, aligned with the wealthiest landowners, which increasingly became dominated by US interests and cut a deal with the American Mafia who controlled the drug, gambling and prostitution business. Growing dissent and riots against the gross inequality that was being created by this corrupt system, were met with increasing repression and ultimately the execution of thousands of people. In turn this created a ripe environment for a young radical, Fidel Castro, supported by his younger brother Raul and the famous Che Guevara to foment a revolution. The revolution began unpromisingly, low in numbers and suffering many devastating defeats. Through a combination of luck, determination, charisma, better mobilisation of the increasingly restive rural population and improving military tactics, Castro ultimately prevailed in 1959. Once in power, advocates of Marxist-Leninism were appointed to senior government and military positions. Most notably, Che Guevara became Governor of the Central Bank and then Minister of Industries as well as being responsible for the trials and firing squads which dealt with alleged war criminals. This was a set of powers which no other central banker has ever had, but every one of them may wish for. Businesses, private property and land were nationalised and given to peasants to use. Within two years the economy was facing the first of many crises, with productivity slumping. However, this did not stop the move towards full fledged communism, which was spurred in part by US attempts to undermine the Castro regime. In particular, US President Eisenhower secretly authorised the CIA to ally with the Mafia and disgruntled Cuban exiles to overthrow Castro’s government. Supported by his successor President Kennedy, the attempted invasion of this motley coalition via the Bay of Pigs in 1961, was a fiasco, with Castro leading the army to rout the invaders. With the onset of the Cold War, Cuba ended up firmly in the Soviet orbit and became a one party state, heavily dependent on its relationship with the USSR. Castro became the first foreigner to be awarded the Order of Lenin. In the fashion of Mao and Lenin, Castro sought to increase revolutionary zeal domestically, while cracking down harshly on dissent. 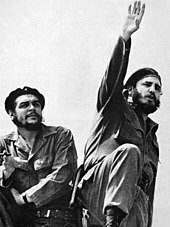 And he did his best to promote revolution in various other parts of the world, most notably in South America and Africa, where Cuban soldiers were used in many civil wars. He backed Che Guevera who returned to being a revolutionary, travelling through South America and Africa, before being killed by CIA trained troops in Bolivia in 1967. Will there ever again be a central banker with such a colourful resume? Influenced by China’s Great Leap Forward, in 1968 Castro proclaimed his own Great Revolutionary Offensive, closing all remaining privately owned shops and businesses and denouncing their owners as capitalist counter-revolutionaries. All of these measures caused the economy to go into a further slump and then stagnate with a massive loss of financial reserves. Soviet help was critical in preventing a disaster. On a positive front, Castro was able to use Soviet aid to implement important social projects. Major emphasis was placed on education, and under the first 30 months of Castro’s government, more classrooms were opened than in the previous 30 years. Health care was nationalized and expanded, with rural health centers and urban polyclinics opening up across the island, offering free medical aid. A third aspect of the social programs was the construction of infrastructure; including substantial road, water and sanitation programs. Fourthly, all Cubans were, and continue to be, supplied with a basic amount of food free of charge. But the Cuban economy was critically dependent on the USSR for trade, technology, armaments and foreign investment. By the mid 1980s, over 80% of its trade was with the USSR, which paid 11 times the market price for Cuban sugar. This system started to come under pressure though with Mikhail Gorbachev’s political and economic reforms beginning in the 1980s and completely disappeared in 1991 when Boris Yeltsin abolished the Communist Party, introduced a capitalist multiparty democracy and officially dismantled the USSR. This led Castro to declare a ‘Special Period’ – code for extreme economic austerity, including dramatically reducing petrol rations, importing Chinese bicycles to replace cars, shutting down factories not producing essential goods, using oxen to replace tractors, firewood for cooking and electricity cuts that could last for 16 hours a day. By 1992, the Cuban economy had declined by over 40% in under two years, with major food shortages, widespread malnutrition and a lack of basic goods. This forced Castro to moderate his policies somewhat. He ceased support for foreign militants, legalised free farmers’ markets and small-scale private enterprises, eased certain restrictions on emigration, allowing more discontented Cuban citizens to move to the United States. The Special Period came to an end with the election of the left wing Hugo Chavez to the Venezuelan Presidency in 1999. This led to an agreement whereby Cuba would send over 200,000 workers, including teachers and some tens of thousands of medics to Venezuela, in return for receiving subsidised oil. Cuba also provided military intelligence and other support to help prop up the Chavez regime. The alliance helped to boost the Cuban economy, albeit at the expense of the teachers and medics – the latter were paid about $US20 a month and began in increasing numbers to flee to the US via Columbia. The decline of oil prices and death of Chavez have undermined the economic value of this alliance during the past decade. On July 31, 2006, Castro delegated all his duties to his brother Raul due to acute ill-health. While the transfer was described as a temporary measure, Fidel’s health precluded him from returning to visible power. In November 2016 the death of Fidel, the last true revolutionary Marxist leader was announced, leading Cubans to a period of considerable uncertainty and change. So what of Fidel Castro’s legacy and whereto Cuba from here? It is worth reflecting that both Singapore’s Lee Kuan Yew and Castro came to power in 1959, both running small island countries, albeit Cuba was much wealthier, thanks to having more natural resources. They both died within a year of each other, but as Forbes magazine recently pointed out, the contrast in outcomes for their respective countries is stark. Lee spearheaded a remarkable transformation. He took a country that had no natural resources, not even enough drinking water, and a very poorly educated population and made it one of the world’s most dynamic and wealthy nations. And while Lee Kuan Yew was relatively autocratic, the average Singaporean compared to the average Cuban, enjoys more freedom of expression, better: health care, education, life choices and potential to thrive, than the average Cuban. Lee Kuan Yew began with a reputation for being a left leaning, anti-imperialist firebrand. But in power he was open to learning, developed a coherent development philosophy and was pragmatic in the face of the realities of economics, rather than being stuck in an ideology that was clearly failing. As a result today Singapore’s GDP per capita is almost six times greater than Cuba’s per capita GDP of a little under $10,000. Reflecting different incentives to work, about two thirds of Singapore’s population is in the workforce, compared to less than 45% for Cuba. At all levels of society, Singapore provides its citizens with a better standard of living and more opportunities to thrive. It is a moot point what Marx and Lenin would have concluded had they visited Singapore as well as Cuba. The danger is that as demagogues and ideologues, they would have stuck with their failed ideas, as Castro did for far too long. As a result, today Havana, once a grand city, is literally crumbling. Kicking out wealthy families from grand houses and providing tenancy, for no or low rent, provided a temporary palliative in 1959. But with no ownership rights, maintenance has been non existent. Having walked at least 10kms a day through street after street in Havana for a week, the number of buildings that are collapsing around the ears of their occupants is astonishing. The opening of tourism as well as the UN targeting various world heritage buildings, has provided some new and restored buildings. Allowing tenants to have some ownership rights and the ability to sell their properties is helping, but the rules are still opaque and there is simply not enough certainty to encourage significant investment . The streets are filthy with the smell of sewage prevalent in many areas, reflecting broken pipes. Even though car ownership is minimal as are traffic jams, the fleet is so old that it spews out pollution which is odorous, visible and can sting the eyes. Shops are few and far between and do not have much to offer. The promotion of tourism has seen the growth of bars and small restaurants. While providing a useful source of employment, tourism has also driven up the prices of scarce food for locals. For all of these problems, it is a sad reflection that Fidel Castro has probably been Cuba’s best leader since the first Spanish invasion over 500 years ago. While he followed the Cuban tradition of repressive political and disastrous economic policies, he did at least achieve something that no previous leader achieved – educating the population, providing a basic level of universal health care and instituting a social security system that provided for basic needs. It is noteworthy that Cuba’s life expectancy and child mortality rates are comparable to the USA. Not a huge amount of wealth is required to provide humans with the basic foundations for a good life. And if wealth is accompanied by ‘affluenza’ the disease of excessive materialism, it does not produce any meaningful increase in enduring wellbeing. The peasants and disadvantaged in Cuba, at a basic level may be better off, or at least comparable to their counterparts in the USA and their support for the Castro regime has generally been solid, notwithstanding periods of hardship. Opposition has mainly come from the middle class and professionals, who have far less opportunities than their American counterparts. Their ability to emigrate to the USA, illegally, or in more recent times legally, has provided a valuable pressure release valve. While most of Castro’s international forays were failures, he was a staunch opponent of racial discrimination generally and apartheid in particular. He was celebrated by Nelson Mandela for sending Cuban troops to Angola in the 1980s, forcing the withdrawal of invading South African troops and contributing to the collapse of the apartheid regime. And today the country is independent, no longer a pawn of the Spanish, the Americans, the Russians or anyone else. There is a platform for further economic, political and social reform, which could see the country emerge from the shackles of communism and to develop its full potential. So Cuba is at a critical turning point in its history. Raul Castro has continued and cautiously accelerated some of the reforms that Fidel began, most notably in agriculture and tourism. And improving relationships with the USA was a key step, albeit Cuba still suffers from American sanctions. While an important step forward, the reforms to date have not occurred in the context of a framework that is clear in its vision, philosophy, direction or goals. The whole process of decision making and what is allowable is opaque. While further economic reform is important and necessary, thoughtful evolution now is what is required rather than revolution. Cuba’s next generation of leadership has a chance to develop a coherent philosophy, based on a pragmatic assessment of what works and what does not. They have the chance to draw broadly from the evidence of a variety of systems and the latest research on what is important to create enduring wellbeing for humans. In this regard as they further reform the economy, they could usefully learn from Bhutan. In its evolution from an absolute monarchy, to a modern political and economic system, the Bhutanese government has sought to assess policies in terms of the impact not just on GDP, but also on Gross National Happiness (see my piece Bhutan: the happy magical kingdom). In short the optimistic scenario for Cuba from here would be the emergence of enlightened leadership with the courage to shake off its past adherence to the policies of demagogues. And which is able to craft a set of policies, suited to Cuba, drawing from the best in the world. Whether this, or a darker period awaits Cuba at the elections next year, when Raul Castro will step down, remains to be seen. But the country is a fascinating one for real travellers, looking to experience a country which offers something very different to standard tourist fare. It also provides a useful reminder of the long term consequences of simplistic economic policies, which are being peddled in various guises by the rise of populist leaders around the world. Our most memorable experience in Havana was being taught how to dance salsa. There were many aspects of this experience that are a metaphor for Cuba. Our teacher was a graduate in mechanical engineering, who had never worked as an engineer because the salary was only around $20 per month. After working as an air conditioning mechanic, he moved to teaching tourists salsa, something that he does very well. His female assistant, a young, very intelligent, mixed race black woman, had started to study medicine. But the prospect again of a low salary (also about $20 per month) had caused her to switch to studying dentistry as a conduit to becoming an orthodontist, which provided the prospect of doubling her salary. But with the rise in tourism, she was also studying Italian and English and using her talents as a dancer to make more money part time than she is likely to do if she ever takes up dentistry. A country where salsa teachers earn more than professionals has a major economic problem. But economics aside, I have never seen so much joy and energy than watching Cubans from all walks and persuasions salsa in squares, accompanied by blaring ghetto blasters or in cheap night clubs. My mother loved dancing in all its forms and was a gold medal ballroom dancer – a talent that, notwithstanding enthusiastic efforts on my part, I did not inherit. But even she would have been left behind by what we saw on the streets in Cuba. It was a valuable reminder that what can make people happy, at a deep and visceral level, does not require much. We were certainly much happier for the experience. I read your commentary about Cuba with great interest. Thanks also for the summary of Cuban history of the last 60/70 years. I remember a lot of it and have always had a passing interest in Cuba and how it maintained it’s adherence to the “Revolutionary cause” in the face of economic failure. The interesting point you draw about relative happiness compared to so called “advanced Western culture” really highlights the fallacy that wealth can bring happiness. A lot of people in our society don’t seem to know when they are well off compared to others in this world; they need to travel more to places where they can see real disadvantage and observe how the people there cope.